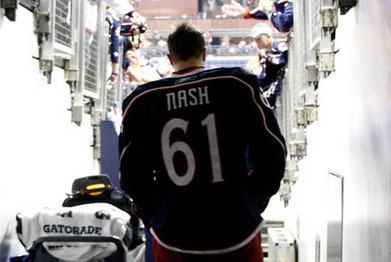 Dirty Dangle Hockey: Where Will Rick Nash Land If Traded? Where Will Rick Nash Land If Traded? Earlier this week, the Rick Nash rumours started when Columbus Blue Jackets GM, Scott Howson, made it known that he was open to all options to improving the team, and would listen to trade offers for his captain, Rick Nash. Howson was fleeced in the Jeff Carter deal and now has other GM's circling his team like hawks looking for scraps. Howson needs to be patient here and make sure he gets the best return possible to turn the club around in a winning direction for the future. Have other GM's compete against one other and deal with their crazy fan bases who are calling into radio shows every night demanding their GM's to land Rick Nash. It's not every day a player with Rick Nash's skill set becomes available and Columbus needs to maximize on his return, and get some assets that as a group can be better than just one player. Looking at past trades similar to the Nash situation in which a star player is traded to help a rebuild, they were not very good in hindsight. Remember the 2008 Marian Hossa sweepstakes? Atlanta traded Hossa and Pascal Dupuis to Pittsburgh for Colby Armstrong, Erik Christensen, Angelo Esposito and a 1st-round selection in 2008 (Daultan Leveille). Brutal trade, but the Joe Thornton trade in 2005 has it beat. Fresh after signing a new contract and leading the team in points by a substantial margin, then Bruins GM, Mike O'Connell, traded Jumbo Joe for Marco Sturm, Wayne Primeau, and Brad Stuart. It's imperative that Howson does not make these mistakes and properly handles this situation. When you take a look at the Blue Jackets depth chart you can see they do have some nice defensive prospects in John Moore and David Savard coming down the pipe line. At centre Ryan Johansen looks to be a future number one centre and undersized forward Cam Atkinson could be a top six forward one day. But what this organization really needs is someone to stop the puck and give the team a chance to win every night, like Steve Mason circa 2008-09. Looking at Rick Nash's alleged list of five teams that he'll agree to go to in a trade, let's see what potential players Scott Howson could get in return from the clubs if he's looking for a combination of young established players, top prospects and 1st rounders. 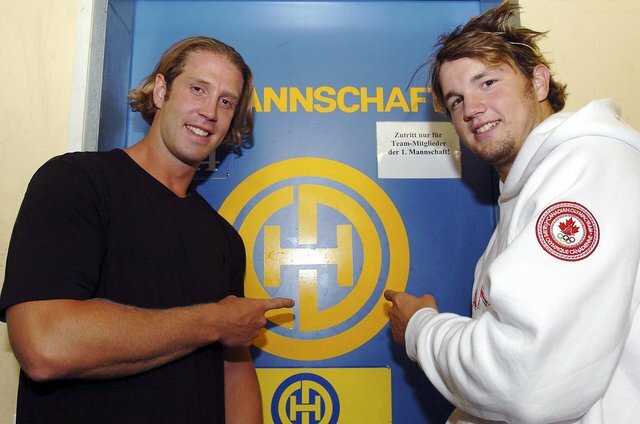 Reuniting Rick Nash with Joe Thornton could be a dangerous thing as the two dominated the Swiss League and Spengler Cup when they played for HC Davos during the NHL lockout. Players of interest include: Thomas Greiss, Logan Couture, Jamie McGinn, Jason Demers and Marc-Edouard Vlasic. The Sharks have some youth with new contracts coming up, they might have to toss in Martin Havlat to even out the contracts. The Kings drafted well for years and have a cupboard full of good prospects and younger players. Some players of interest include: Jonathan Bernier, Andrei Loktionov, Tyler Toffoli, Slava Voynov, and Derek Forbort. Obviously Bernier would be a great addition as he is ready to be an NHL starter, and Loktionov, Toffoli, Voynov, and Forbort will all be solid NHL players. LA would need to dump some salary to squeeze in Nash's contract, so Stoll or Penner might be part of any deal, or for Columbus' nightlife sake, Mike Richards who would be reunited with booze brother, Jeff Carter. The defending Stanley Cup champions are a powerhouse team in the NHL and if Rick wants to win, this would be a good start. Some potential players of interest include: Tuukka Rask, Dougie Hamilton, Jordan Caron, Steven Kampfer, Jared Knight, and Ryan Spooner. Rask is ready to start, and Boston's prospect pool is very solid if Howson wanted to pick any of those players in return. The Bruins have plenty of centre options to dish Nash the puck, which could take him to new career heights. Rick Nash-Brad Richards-Marian Gaborik as your first line is pretty scary and the way New York is steamrolling the East right now they would become bonafide Cup contenders. Players of interest include: Derek Stepan, Carl Hagelin, Chris Kreider, Michael Del Zotto, Ryan McDonagh, Artem Anisimov, and Tim Erixon. The Rangers already have a lot of young players with NHL experience that are making an impact on the team, and Howson could be looking are some of their defensive studs to help the Jackets blueline. A Toronto boy (Brampton is close enough), Nash jerseys would fill the ACC as the Leafs would have a big named star for the first time since Mats Sundin. Players of interest include: Jonas Gustavsson, Nazem Kadri, Jake Gardiner, Joe Colborne, Keith Aulie, Matt Frattin, Nikolai Kulemin, Luke Schenn, Carl Gunnarsson, and Cody Franson. Toronto has enough young players for Howson to consider, but have one of the weakest goalies to offer in Gustavsson. Wherever Nash goes, or even if he doesn't get moved, at least he's giving us something to talk about. As a sharks fan all I would give away would be clowe demers mitchell and sexsmith or sateri amd maybe just a lil suga on top. But that's it, nothing else. Burke has always wanted him and he will over pay to get him. IMO the only thing certain here is Howson blows it. Whether it's the Leafs, Rangers, Kings, whoever.